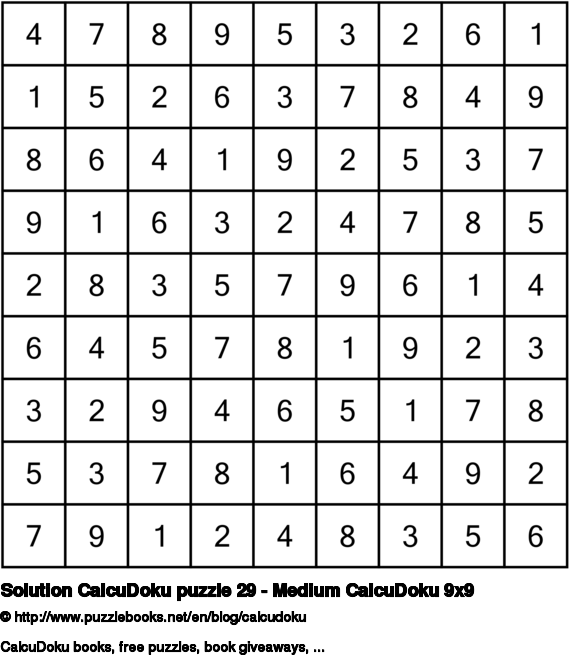 Click here to view the solution for CalcuDoku puzzle 29 - Medium CalcuDoku 9x9. I hope you managed to solve it and had a lot of fun trying to do so. Is solving CalcuDoku puzzles a passion for you? You will most certainly enjoy today's CalcuDoku puzzle. How to play CalcuDoku: The goal of CalcuDoku is to fill the grid in with the numbers 1-N (N is the number of rows/columns in the grid) such that: * Each row contains exactly one of each number. * Each column contains exactly one of each number. * Each bold-outlined group of cells (cages) contains numbers which achieve the specified result using the specified mathematical operation (+, -, ×, ÷). Sometimes the sign +, -, × or ÷ is omitted, in which case you also need to find the correct sign. * Numbers may repeat within a cage. 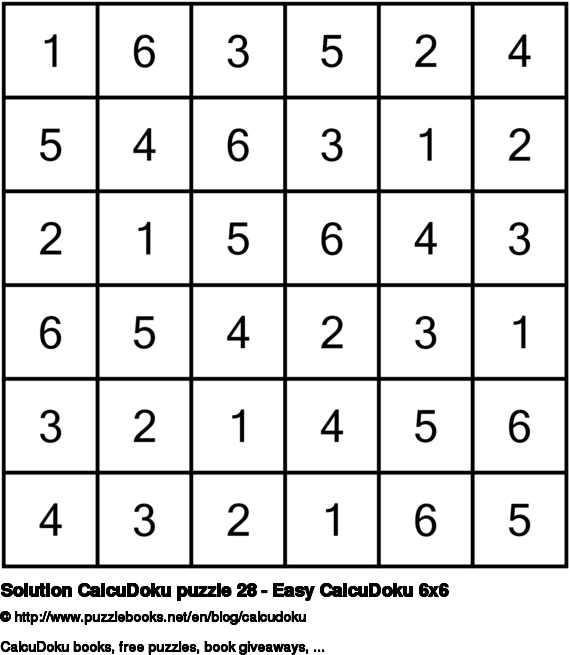 Click here to view the solution for CalcuDoku puzzle 28 - Easy CalcuDoku 6x6. I hope you managed to solve it and had a lot of fun trying to do so. CalcuDoku puzzles are really fun brain games. This logic puzzle will give your brain a great exercise. 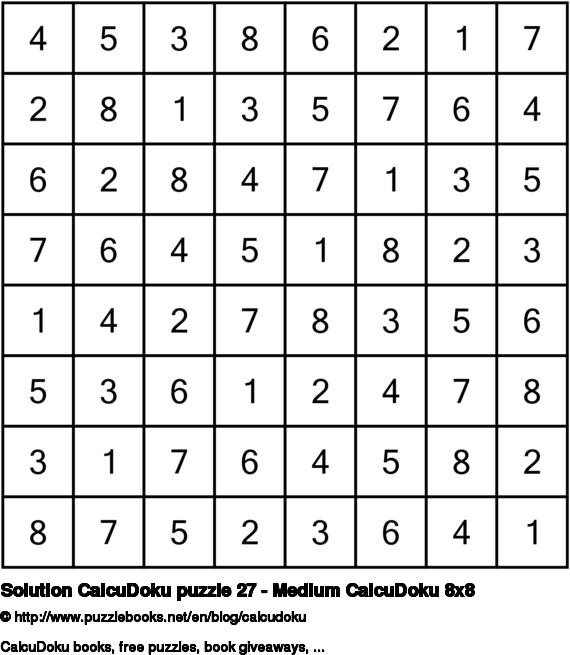 Click here to view the solution for CalcuDoku puzzle 27 - Medium CalcuDoku 8x8. I hope you managed to solve it and had a lot of fun trying to do so. I always find it gratifying when I finally solve a CalcuDoku puzzle. I felt thrilled when I solved this CalcuDoku puzzle. 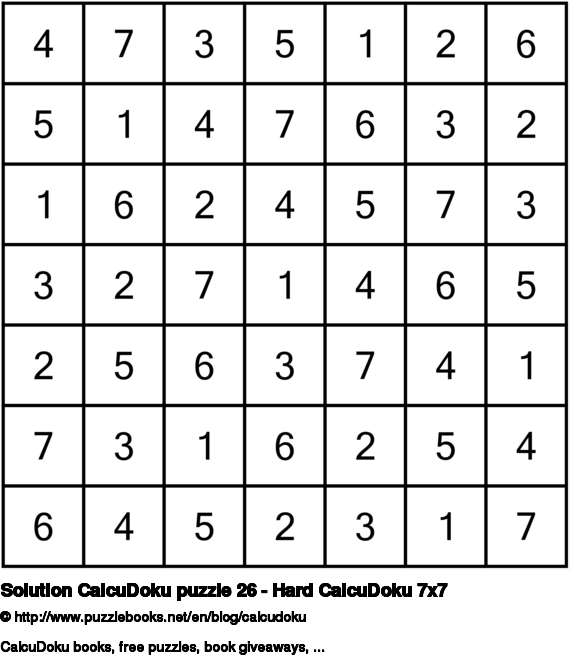 Click here to view the solution for CalcuDoku puzzle 26 - Hard CalcuDoku 7x7. I hope you managed to solve it and had a lot of fun trying to do so. Is solving CalcuDoku puzzles an obsession for you? You will most certainly enjoy today's CalcuDoku puzzle. 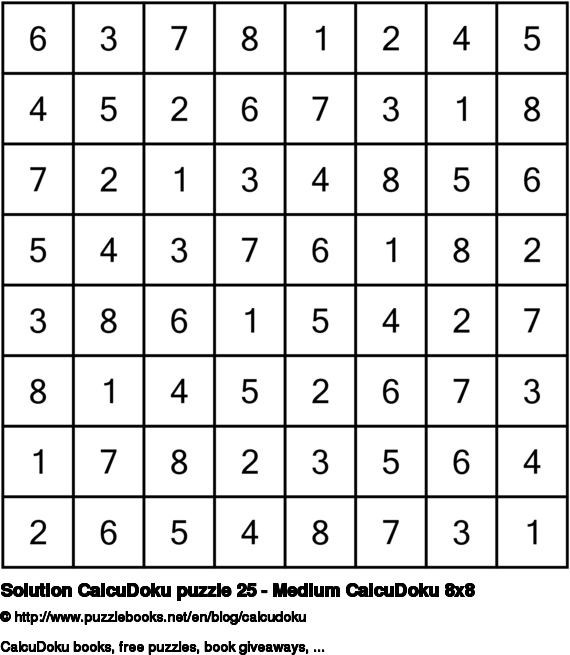 Click here to view the solution for CalcuDoku puzzle 25 - Medium CalcuDoku 8x8. I hope you managed to solve it and had a lot of fun trying to do so. Solving a CalcuDoku puzzle is really fun for the brain. Try it and enjoy!